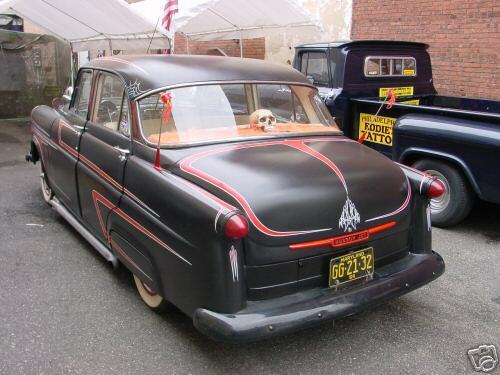 Here we have a 1954 Hudson Jet, 4-Door Sedan originally from the Virginia/Maryland/Baltimore area. 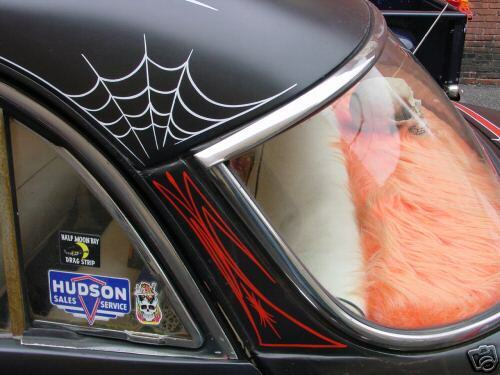 Flat black primer is the backdrop for red scallops and red and white pinstriping, including spider webs. 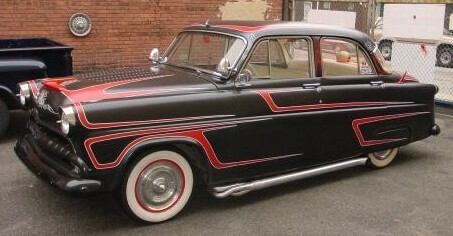 Extras such as the louvered hood, skirts, headlight dress up rings, 1955 Chrysler New Yorker front hubcaps, wide white wall tires, dummy spots, and working sidepipes highlight this Jet. Although a fender antenna is operative, the original antenna is still mounted above front windshield. 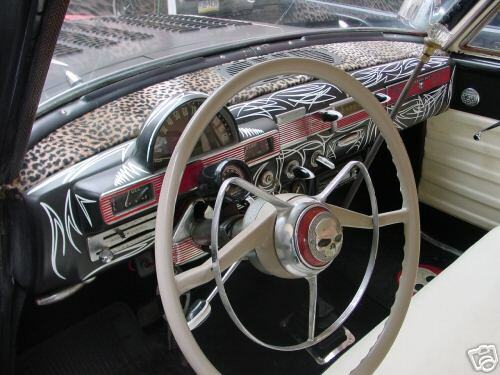 Interior features include totally pinstriped dash with front tray covered in leopard cloth. Steering wheel is original and adorned with skull on center. Although original guages do work, they are not hooked up. Rather, after market gauges are used and a cd unit is mounted under dash. A base drum pedal is used for a gas pedal. A tall nostalgia shifter from a 1954 ford school bus is topped with a cut glass doorknob.Hanging from the roof, is a hand made Bordello style Chandelier. Black dingle balls border the headliner! On the back deck sits a skull that doubles as a third brake light. Black pile carpet lines the floor and skull head rubber matts rest on it. A MOPAR motor has replaced the Hudson 202. Under the hood you'll now find a 1967 Plymouth 273 from a Valiant with 1968 Mopar 318 Heads and a 904 B Automatic Transmission. It also has a larger oil pump and pan from a 1970 Dodge 3/4 ton truck. There's also a dual exhuast into working side pipes! A 1993 Chevy s-10 rear with 308 gears now sits under the back half. Original suspension is still functioning. To top it off this car has been in publications such as Car Culture Deluxe! JalopyJournal.com Home of the HAMB! KillBillet.com Dedicated to fun, low budget, traditional, rusty, patina Rat Rods and Old School Hot Rods built with junk yard parts. RatRodsRule.com A place for people to talk about rusted old cars, hot rods, bikes or what ever! Is this Jet a rat rod? Typically rat rods are void of paint, instead having a "rough" finish. Many of these cars appear unfinished with primer paint jobs being common. Other common rat rod finishes include "patina" (the original paint with rust and blemishes intact), a patchwork of original paint and primer, and bare metal with no finish at all in rusty or oiled varieties. While the worst enemy of most car builders, rust is often acceptable and appreciated by a Rat Rodder. Interiors of rat rods will vary from fully finished to a spartan, bare bones form. Mexican blankets and bomber seats form the basis of many rat rod interiors. Most are designed to be functional without many creature comforts although this will vary with the owner’s taste. While most Rat Rods are equipped with Flathead V8’s, early Chrysler Hemi engines, or more modern Small Block V8’s of any manufacturer (Although Chevy is the most common), of varying displacements and modifications, there is quite a variety in the types of engines used. It is not uncommon to see straight sixs, four cylinders (Most commonly, those originally offered in Ford Pintos), V6's, Straight 8, or even diesel engines. Most Rat Rods are built rear wheel drive, with an open driveline. Rearends are typically passenger vehicle (Usually S-10 or Maverick pieces), as are transmissions. The Ford Banjo rear-end is popular, as is the "Quickchange" type as used in many early hot rods. A "solid", "straight", or "beam" axle, which was commonplace under most cars until the late 40s and under most trucks until the late 60s, but now only commonly found under modern medium and heavy duty trucks is commonly accepted as the only type of front suspension that will look right when exposed without fenders on any vehicle running with an open front suspension. Independent front suspension is discouraged, simply because it appears too "bulky" when exposed. Most Rat Rods use a 1928-1948 Ford I-beam axle with a transverse leaf spring. Although any solid axle is acceptable, parts are easy to find with the amount of after market products available for the Ford I Beam axle. Springs vary from coil, parallel, and transverse setups in the front and rear. Parallel is not as often seen as the more common single-spring transverse setup, although both are used commonly. Coil springs are often deemed unsightly without fenders, but are still occasionally seen. 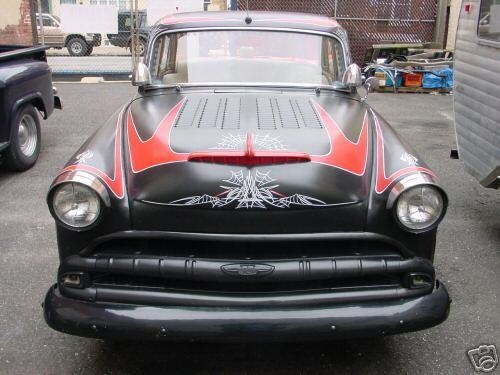 Several aspects of the "Rat Rod" style are often criticized by fellow hot-rodders. Most notably is the amount of effort put into some cars to make them appear and/or perform "unsafe and scary". The methods involved are sometimes cosmetic such as radically chopped, sectioned, or lowered vehicles. Other methods involve the engineering and construction of the vehicle with bad welds, inadequate construction/materials, or unsafe braking, steering, and structural engineering. This is a matter of concern to the general public as well because they could represent a threat to public safety. However most of these "unsafe" vehicles are never inspected, registered, insured, or street driven. The most severe criticism, however, is leveled by preservationists against those who alter any rare surviving original or historical vehicle, thereby destroying their historical value as a pristine specimen. In addition, "traditional" Hot Rodders will often criticize the "exaggeration" of some of the cars constructed following the "Rat Rod" style. 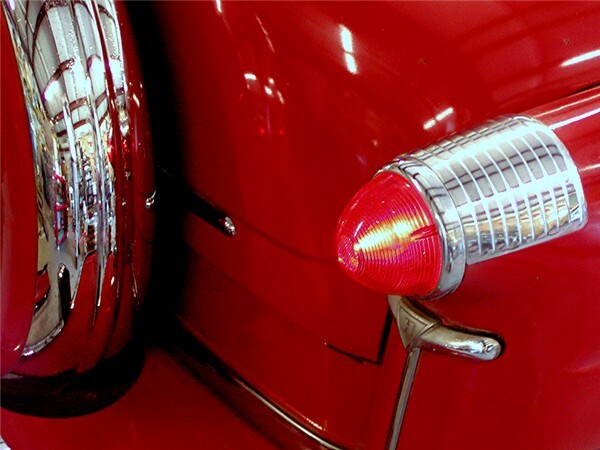 Some vehicles or body styles would quite simply not have been used as a Hot Rod in the early days of hot rodding. Maltese crosses, skulls, and other accessories are often tacked on regardless of their absence in real hot rods. Biker, greaser, rock-a-billy, and "Punk" culture is often credited as influence that shapes of Rat Rodding.